With all the advances of technology it really is impractical to not take full advantage especially from a monetary standpoint. The rapid advancement of the internet has allowed for gadgets and the creation of things to save us money such as netTALK DUO WiFi. 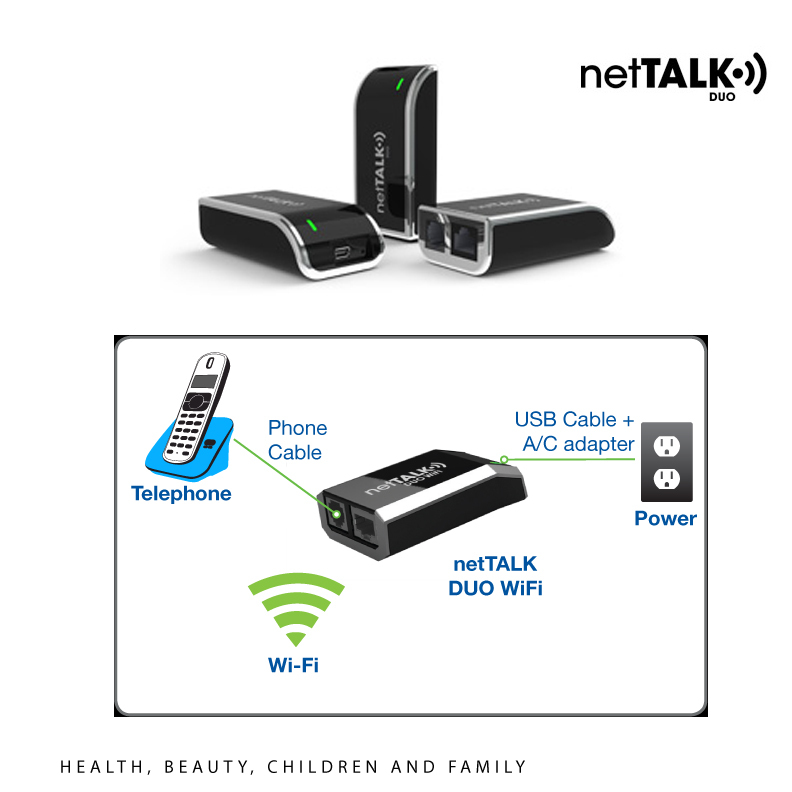 netTALK is the world's first low-cost wireless VoIP telephone device. This plugs into the modem or your computer or just operate from any WIFI connection. Not only do you get free calls to the United States and Canada but for a low fee, you can also make international calls. One free year of service and afterwards, only $29.95 a year plus tax. Imagine the savings you will incur with this! New call blocking feature so no more annoying calls from those you don't want to talk to. Caller ID as well to screen those telemarketers. Choose your own phone number which is a big plus if you are one of those that have had the same number for years. Live tech support, seven days a week. Friend or family ahve a DUO? Phone calls are free even internationally! 3-way calling and conference calling so if you are the small business owner, what a great way to bring more savings into your business plan. Enhanced 911 and 411 directory assistance. Visual voice mail <-- this is great! I love being able to see my voice mails. Video phone application as you don't want to deny your parents a chance to see the little ones! I have tried it and can honestly say I like it better than my existing service which is through Vonage. I like the ease of set up, the ability to have three ways to connect and not have to worry about having to have my phone modem connected to the wireless internet modem which limits many possibilities for a phone and fax set up. With netTALK, I just used my existing WiFi. My area wasn't quite in the system but that wasn't a problem as I am able to just use my existing number. I also had crystal clear sound and no interruptions. Since you get a free year of service, it's really a great deal priced at $64.95 plus tax. It's available at Target Stores as I can vouch for that since I just saw it at my local Target. It's also available at other leading retailers. Recommend or Not Recommend? I would definitely recommend it. netTALK also has a new and free Android App (works on most Android devices) that provides Free Calling throughout the US and Canada with the option to add low-cost international TALK credits to make calls from anywhere to anywhere in the world (with cell phone / WiFi service) without running up cell phone minutes or roaming charges. Great for traveling and keeping in touch with family and friends abroad! The app is available free at www.nettalk.com and at Google Play. One lucky reader will win their own netTALK DUO WiFi! *Disclaimer: I received a free product for the purposes of this review and giveaway from netTALK. The opinions are of my own.